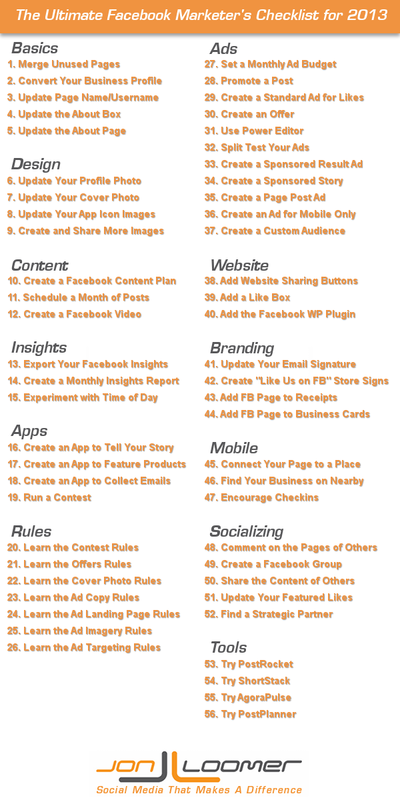 Inspired by Heidi Cohen’s 13 Step Blog Checklist to Make 2013 Your Best Year Ever, I’ve put together my own checklist for Facebook marketers. Maybe you’ve already done some of these things. Check those things off. But chances are good that there are several items here that you need to take a look at to make your Facebook marketing efforts awesome in 2013. Start here! So print it out. Bookmark it. Pin it. Share it. And keep track of your progress throughout the year! There are some small things that you may have overlooked in 2012. Let’s change that in 2013. Do you have multiple pages floating around that represent the same thing, but you only use one? This can be potentially confusing to users. It’s time to consolidate! Facebook allows you to merge up to six pages, assuming you control them all, they have the same address and have the same purpose. This is the year you stop playing dumb. It’s time you stop using a Facebook profile as the face of your business. It’s unprofessional. Stop trying to convince yourself that customers actually want to “friend” your business. And it’s time you understand all of the many benefits of a Facebook page over a profile. If you still use a profile, all hope is not lost. Let’s convert it! Facebook isn’t particularly consistent with this option, but most pages tend to have the option to either change or request to change their page name. Is your name consistent across your websites and social media accounts? Does it violate a naming convention you’ve established? It’s possible that potential fans are having a hard time finding you. And also make sure that you’ve established an easy to remember username so that you can give out the URL to your Facebook page. That little box directly under your profile photo can be valuable real estate if used appropriately. If you have a physical location, make sure that you’ve filled your address, phone number and hours of operation. Otherwise, use this space to embed a link and drive traffic to your website. When users click on the “About” link immediately under that box below your profile photo, they’ll be directed to your About page. This is the page that Google and other search engines will index, so it’s important that you fill it out completely. Include all necessary key words and information, products and relevant links. If you want people to take you seriously — particularly potential customers being exposed to you for the first time — then you need to give careful thought to design elements of your Facebook page. In 2013, take a look at your design and aim to make them a higher priority. Your profile photo is like a brand logo. When people see it — on Facebook or elsewhere — they should automatically recognize you. This is fine if you have a clear, professional profile photo. Not so good if it’s of low quality. When’s the last time you updated this? Maybe it’s time in 2013. While I advise that you have a main cover photo that can be swapped in and out, you should also consider a cover photo that can be swapped in based on the season or current promotion. Again, if you’ve been skimping on this image, you should consider replacing what you used in 2012 for good. Carry over your company branding across your cover photo, profile photo and app icons. Look at the fonts, colors and images used, and aim to keep them consistent. Maybe you need to take more photos. Maybe you need to hire a photographer. Maybe you need to create an infographic template to easily generate graphics that can be used to represent your content. While reach may be higher for text only posts, photo shares still tend to get more engagement. Take advantage of this. Stop winging it. This will be the year when you get serious about your content! Leverage your assets, content and resources and put together a plan. While you may be able to eventually rely more on a “read and react” strategy, you should only do this after first establishing a routine. Do this by successfully implementing a Facebook content plan. I often hear “I don’t have time” to post frequently or consistently. Since you can schedule posts, this is no excuse. Find your evergreen content and schedule out posts once per day for an entire month. Don’t use this to replace your Facebook activity, but to complement it. If you want to show a more personal side of your brand, create videos. While you could upload a video to YouTube and share the link, I encourage you to test out Facebook video at least once. There are benefits to Facebook video, which includes a much larger video play thumbnail that applies not only to the post but to advertising. Facebook gives you the tools to make you a successful Facebook marketer, but do you use them? Most people do not. This is the year you take advantage of the mounds of data available to you! When we talk about Facebook data, everyone knows about Likes, Comments, Shares and even Reach. A small percentage of marketers dig into their web version of Facebook Insights. But do you know that this is only a small percentage of the data available to you? You can download mounds and mounds of data — both post and page level — that can give you great insight into your marketing efforts (bad but necessary pun). Ideally, you’ll do this every month of the year. But I want you to do it at least once. Take the data provided to you within Insights and generate a report that recaps what worked and didn’t work for a given month. By doing this, you will begin to clarify actionable goals within your Facebook marketing efforts. Don’t always post at the same time every day. And don’t post randomly either. Strategically experiment with various times of the day to determine what works. Use your Insights to get a better feel for what times of day get you the greatest reach and engagement. If you want your Facebook Page to look professional, you need to invest in creating a few applications. I use ShortStack to create mine (here’s my review). Who are you? What is your brand all about? What makes you unique? When someone lands on your page for the first time, they will be asking these questions. You will attempt to answer this with your cover photo, profile photo, About section and content. But you should also create a tab to help tell this story in a more dynamic way. Strongly consider an introductory video! You’re a business, so you need to make money. What services do you provide? What products do you sell? Create a tab to feature one or a small handful of these things. Feature those products or services with imagery and limited text. Answer every question (benefits and price) within the tab, not forcing the user away to find out more. Ideally, allow them to purchase from within the tab. Otherwise, use a “Buy Now” button that opens a new window. Do you have a blog? Do you have an email list? If you have one or both, you need to build your number of subscribers. Create this tab to feature the benefits of your blog or email newsletter, complete with a sample. Then embed a form to easily subscribe. This is the year you stop carelessly running contests that break the rules (we’ll get to understanding those rules later). Run a Facebook contest that increases engagement or relevant Fan count. If it’s a giveaway, make sure that the prize fits your brand and your target audience. For example, an iPad giveaway is unlikely to bring new relevant Fans. I know. Facebook has a lot of rules. It’s overwhelming. But while you could get away with not understanding that Facebook had rules in place for a while, ignoring them now just makes you look bad. By blatantly breaking rules, you portray your business as unprofessional, lazy or downright unethical. These rules are written down. Learn them! By now, every brand on Facebook should know that you can’t run a contest within posts on Facebook. You need to use a third party app. Yet, hundreds — probably thousands — of brands still do this. They do it because most get away with it. But this is like speeding. Sure, 99% of drivers will speed on by without issues. But you do not want to be that 1%. Break the speed limit on Facebook and you can and will get your page shut down. So do yourself a favor and learn the rules! Did you know that there are rules associated with the creation of Facebook Offers? Well, you do now. Make sure you know them! Your cover photo cannot look like an ad, people! It can’t include contact information or pricing information. It can’t include a lot of stuff. Do you know what it can and can’t have? Check this off your list! You can easily get your Facebook ad rejected if you use the wrong language. Do you know what you can and can’t do? Where you send people with your Facebook ads matters. It’s got to reflect what you promote within your ad, it has to function properly and it can’t trigger pop-ups. There is actually a long list of things your landing page must not do. Do you them? By now, you know (hopefully) that you cannot use purchase information (like “20% Off!”) within a post image that you promote. But do you know the rules for the other types of images that you can’t use within Facebook ads? How you target Facebook users could also get your ad rejected. There are many laws that you need to consider when targeting users both in and outside of your country. Do you know them? If you’re serious about being successful on Facebook to promote your business, you need to get over the absurd notion that marketing on Facebook is free. It’s free to create a page, but it has costs related to time and resources to be successful. And if you truly want to succeed, it’s time to start advertising. That means that you need to quit messing around and set a monthly budget. If you have the budget for a monthly Starbucks, you have the budget for Facebook ads. I don’t care if it’s $5 or $5,000, set a dollar amount that you will dedicate to Facebook advertising in every month of 2013. “Facebook advertising is so hard!” Yeah, it’s a little complicated. But promoting a post isn’t. As long as you meet Facebook’s minimum Fan count (it appears to be less than 400 now), you can promote a post. To check this off of your list, just promote one. Want to get more likes? Create a custom Facebook ad for the sidebar. That’s not so hard, right? If you sell a product or service and occasionally have sales and discounts, you need to test out Offers. The worst is when I see people creating posts that promote a current sale. You could create an Offer and it would be infinitely more viral! If you don’t use Power Editor — the free Chrome plugin for Facebook ad editing and creation — you’re missing out on several key features not available to you in the self-serve ad tool. Power Editor may be a bit clunky, but it’s absolutely worth it. Try it out. Learn to use it! Great, you created a few ads. Maybe they worked, maybe they didn’t go as planned. If they provided underwhelming results, don’t blame the advertising. You need to split test. Experiment with various images, headlines, calls to action, targeting and destinations. Find what works! 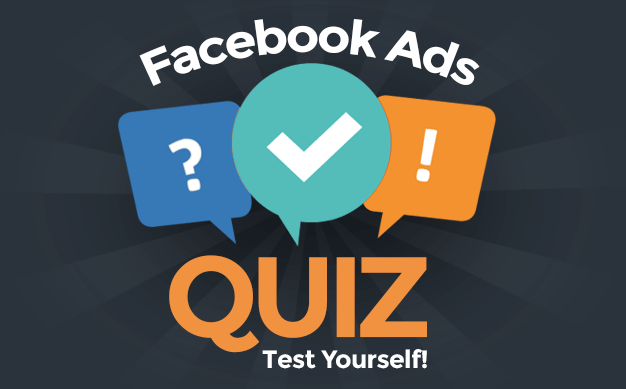 Did you know that you can create a Facebook search ad? Yep, you can. Create a Sponsored Result Facebook ad to target people searching for related or competing pages. This is a feature only available if you use Power Editor, so it’s a good thing you learned how to use it! One of the simplest — but most effective — ads is the Page Like Sponsored Story. When created, this ad unit will surface to friends of your Fans. It simply promotes “[Friend X] Likes This.” You’d be amazed the impact those words will make. You can also promote the activity of your Facebook Fans within your posts by creating a Post Like ad that is again surfaced to friends of Fans. It’s a good way to increase non-Fan engagement. Promoted Posts are great, but they are a bit rigid. If you promote a page post manually with Power Editor, you can better control the budget, length of campaign, targeting and displayed locations. Some advertisers have seen insane success with ads run on mobile devices. If you use Power Editor, you can create ads that appear only on mobile. You’ll reach fewer people, but you may be surprised by the high success rate! This is a little known — but very awesome — feature that is again only available within Power Editor and third party tools that utilize the Facebook API. With Custom Audiences, you can target Facebook users based on email address, phone number or Facebook UID (ID associated with Facebook apps). Upload your customer list, and Facebook will match up email addresses to Facebook users. You can then create ads that target your customers, whether they are Facebook Fans or not. This can be particularly effective if you have a list of customers who have a history of purchasing. Create an ad that promotes a new product and target them! Your Facebook page should not live on an island. You should ultimately be driving people to something you control — Your website. But you should also be using your website to drive people back to your Facebook page. Are you doing these things? If you look to the side, you’ll see a floating box. That’s the Digg Digg WordPress plugin. It includes sharing buttons for Facebook, Twitter, LinkedIn, Google+ and Pinterest. What buttons you include will depend on your target audience. But you must at least include Facebook! Look over to the right and you’ll see my Facebook Like Box. This shows a collage of the faces of people who have already liked my page along with a button for you to do the same. There have been 104 people who have liked my page from that box during the past month. You need one of those! Facebook has also created an official WordPress plugin with a bunch of different features included in it. I actually don’t use most of them, but you might! One such feature is the Recommendations box that shows up on the bottom right of some sites (it currently does on mine!). We need to start looking at our Facebook page URL like we once did our phone numbers, addresses and then website URLs. Stamp that baby on everything! It’s not that hard, people! Every email that goes out from your company needs to include a link to your Facebook page in the signature. I have it. Do you? When I enter your business, is there a sign on the wall to like your page on Facebook? Is it on the tables? Do you tell me what the benefits are? Create those signs! The receipt is something your customer will take home with them. Add the URL of your page to the bottom of it! This should be obvious. Any new business cards that you create should include the URL to your Facebook page. More and more people are accessing Facebook via a mobile device. Don’t assume that Facebook is making your business fully accessible for you! Within the Admin Panel, make sure that you add a physical address and check the box to add a map to your Timeline. When you do this, Facebook automatically generates a Place. This links your page to a location so that users can then check in to your business! Have you heard about Facebook Nearby? You will. It’s a new feature available within the mobile Facebook apps, and it’s going to be big. Users can find businesses closely via GPS, and Facebook will surface those businesses most relevant to them based on likes, friend connections, ratings and more. So make sure that you’re on Nearby, and then check to see how your company is displayed! Your customer is at your business. Now what? Tell them to check in! Create signs encouraging them to do so. This is free advertising for you. Your customers will tell their friends that they are at your business, which is social proof. Perfect for restaurants, bars or any business that benefits from spontaneous social gatherings! This shouldn’t be a surprise to you, but to be successful on a social network you’ll need to make friends. Don’t just build your Facebook page and get ticked off when no one shows up. One of your strategies needs to involve socializing and making friends with other businesses. Use Facebook as your Page and make your presence known by commenting on the posts of related pages. DO NOT SPAM THEM! Simply add value, and start a dialog with these other people. Something I found to be extremely valuable this year was my experiment with Facebook Groups. Create a group to continue a less formal discussion away from your page. This is also a way to show a more personal side of your business since you can only use Groups as a personal profile. Don’t put your audience to sleep by only sharing your own stuff. Also share valuable content written by others. This will not only diversify your content to make you more interesting, but the author of that content will appreciate it! There’s a little box on your Timeline that features the pages that you have liked as a page. I use this real estate to highlight those pages I enjoy the most. It’s again a great way to show appreciation! One step at a time, but by doing these things and a little networking, you can lay the groundwork for a potential partner. Search out people and brands that are complementary and find out ways you can help one another! Always look for tools that will make your Facebook efforts easier. There are hundreds of them, but here are just a few that I use. Make it a priority to try out these tools during 2013! This tool helps you schedule posts at the times your fans are most likely to be active. Definitely one of my favorite tools, I use ShortStack to create my apps and run contests. AgoraPulse is a great tool for Facebook community management and making sense of your Facebook Insights. Also make sure to check out their new tool called Barometer to benchmark your page against hundreds of others. PostPlanner is yet another tool I just started experimenting with that can help with the process of scheduling your content. Need help planning or implementing these items? Let’s set up a one-on-one coaching call!